Evening Rose is an award-winning Traditional Neighborhood Development providing a thoughtful blend of residential, educational, commercial and retail uses. 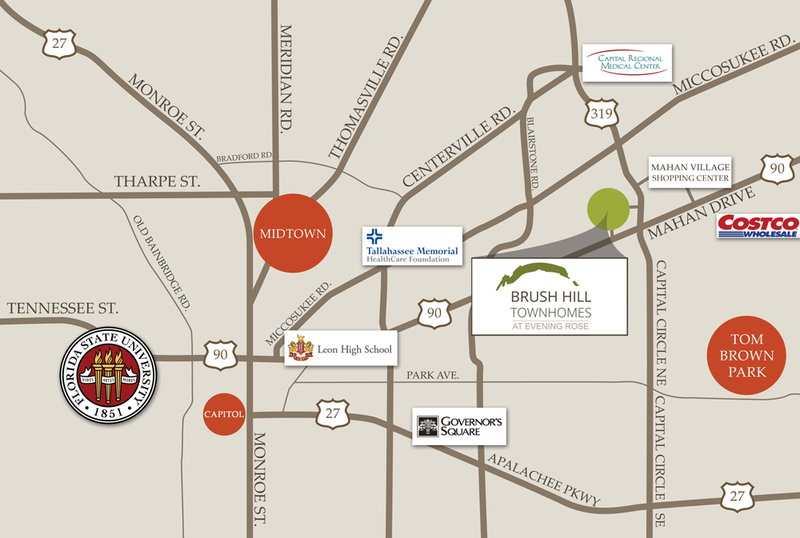 Brush Hill Townhomes is located within the Evening Rose subdivision in the Northeast section of Tallahassee, just inside Capital Circle, and only minutes from downtown Tallahassee. The residential component of Evening Rose offers an attractive mix of single-family homes, cottages and townhomes in diverse architectural styles. All homes are within easy walking distance of the Evening Rose town center which has been planned to include a wide variety of shopping and services. Initial tenants in the Evening Rose town center include The Egg Café, FSU Credit Union, the family dentistry office of Dr. Chaney and Dr. Couch, and two innovative schools - The Learning Pavilion - A Smart Play Preschool with ages infant-VPK, and Classical Leadership Academy - ages toddler daycare - high school. Nearby is the new Mahan Village Shopping Center. From Capital Circle NE, approximately ¼ mile north of Mahan Drive, turn west on Austin Davis Drive, the main entrance to Evening Rose. Proceed west approximately 1,000 feet to the residential neighborhood.